I know there was service in 1992 and 2004 but cannot find the 2004 schedule using wayback machine. Does anyone have a copy they can post? This article from January 2017 mentions possible discussions with the LIRR about building a temporary station. I imagine they would want to do this to reduce the amount of vehicular traffic. The 2018 US Open will be the fifth held here. What did LIRR do the other four times? in 2004 it was actually somewhat easy to find. Can't seem to find any pictures of the 2004 temporary station. Hopefully this time around someone will document it, as it's not everyday they build a temporary station. 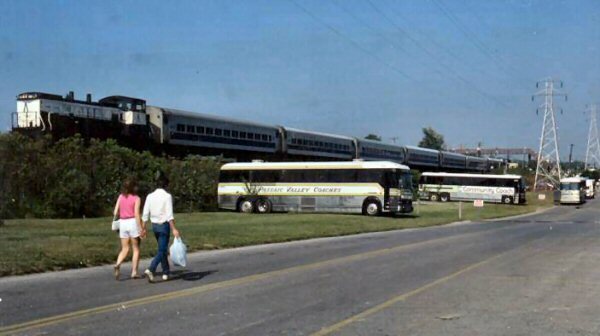 132 of 134 C-3 coaches owned were in service. - No more manual block over this portion of the railroad. The station will be nestled in between the two new interlockings: SH (Southampton) and RPK (Hampton Bays). - The prospect of 21 MARC cars. It is unclear if they will be on the property by that point, but if they are they will not be wasted. The railroad has not added any power since 2004, so they are still strapped of locomotives at this point. - Trains to Montauk are longer than they were in 2004. Trains 8702-8706 going east generally consisted from anywhere between 8-12 cars consistantly throughout this summer. Not even 5-10 years ago this was not the case, especially not in 2004. The Open is actually in about the best time of the summer for it to take place, as the period between Memorial Day and Independence Day is generally the lightest travel period to the East End between May-September. I am agreement that it needs to be documented better. Luckily, we live in a time where we have all the resources in the palm of our hands. Even back in 2004 smartphones were just a futuristic thought. Shinnecock Hills: 2 The former site of “Southampton College” Station. 528’ west of MP86. Site temporarily reused as a station stop for US Open: 6/2004. 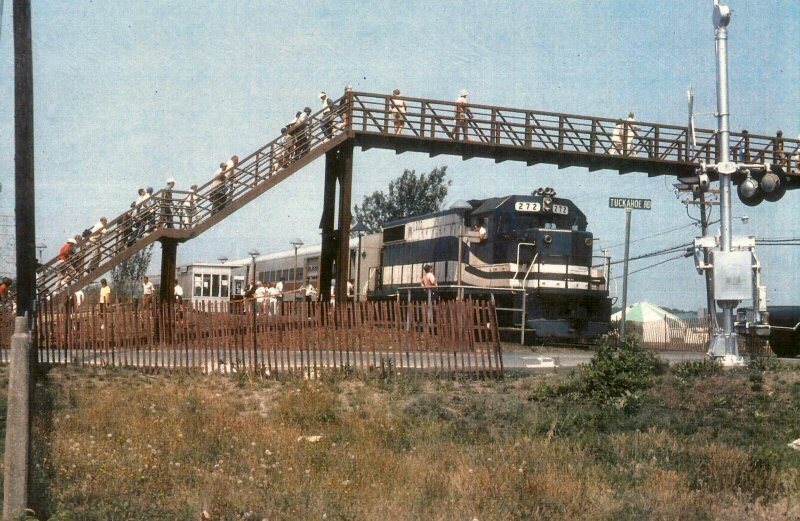 Listed on Special Timetables as “Shinnecock Hills.” Temporary high level platform 2 cars in length erected. Although pedestrians had to walk over the Tuckahoe Rd. crossing, a pedestrian crossover was installed over the highway. All structures removed and station stop discontinued after the golf tournament ended. NYANDW, I emailed you 4 photos of the 1986 US Open Special at the then South Hampton College Station, which you are welcome to post. LB wrote: NYANDW, I emailed you 4 photos of the 1986 US Open Special at the then South Hampton College Station, which you are welcome to post. Ditto, Would like to see it! Given the reference to the motive power shortage, are the MP15ac's configured for use with coaches still? The remaining MP-15's can tow a C-3 car/consist if needed,but cannot supply HEP or MU to the C-3's. The MP-15's that were modded as "power packs" to supply 600 VDC to the MP75's/72's have had that mod disabled/removed. 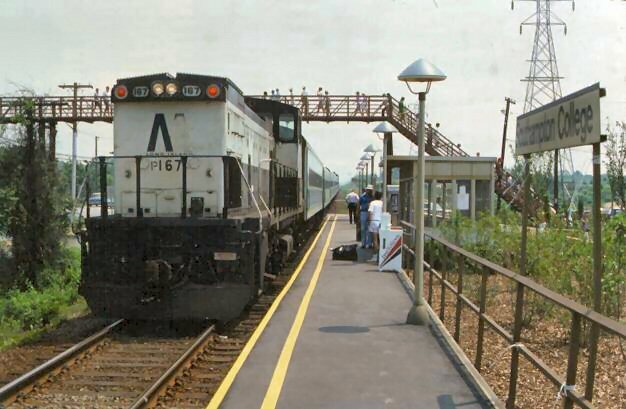 LIRR might "borrow" a few BL20G's From MN to be used with the loaned MARC equipment as a possiblty. That will be a bigger sight to see than the MARC cars; a executioner decending on the LIRR! The first one that will be in service off of the metro-north in NY, even for a small period. ConstanceR46 wrote: That will be a bigger sight to see than the MARC cars; a executioner decending on the LIRR! The first one that will be in service off of the metro-north in NY, even for a small period.